Comedies are tough to get right and a sequel is even tougher. No matter how great the original films are, the sequels seem to fail more times than they succeed. I’m talking to you Revenge of the Nerds II: Nerds in Paradise. Horrible Bosses 2, the sequel to 2011’s Horrible Bosses, brings the whole gang back together. Nick (Jason Bateman), Kurt (Jason Sudeikis), and Dale (Charlie Day) tried to kill their bosses in the first movie, but now are trying to be their own boss. The trio creates a shower companion known as “The Shower Buddy” that they plan to produce and sell. In need of distribution, they make deal with an eager investor named Bert Hanson (Christoph Waltz) to produce 100,000 units. The deal with Hanson goes sour leaving the guys in debt with no product to sell. They come up with the genius idea to kidnap Hanson’s son Rex (Chris Pine) for ransom to make back the money they lost on their invention. Honestly, most of the film’s plot is given away in the trailer. Fortunately that’s not why people buy tickets to see Horrible Bosses 2 – people buy tickets to laugh and the movie has plenty of those. 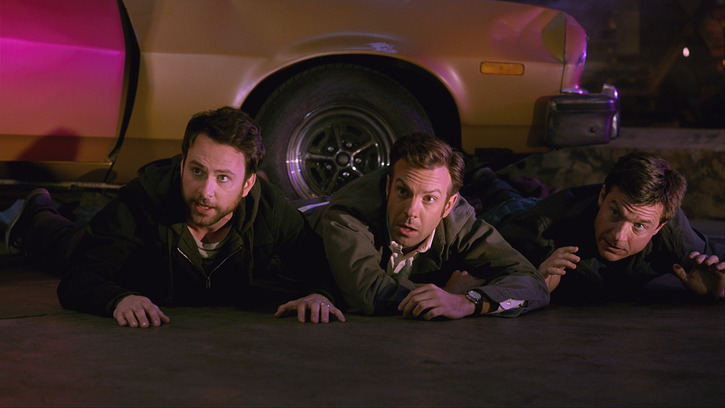 Horrible Bosses 2 dodges a lot of potholes that normally plague sequels by simply placing their three funny leads around different obstacles and allowing them to be funny. You know, the thing they all do best. Imagine Bateman, Sudeikis, and Day as a basketball team’s “Big 3”. Horrible Bosses succeeds by having them do what they do best and surrounding them with outside shooters like Jamie Foxx, Jennifer Aniston, Chris Pine, Breaking Bad’s Jonathan Banks, and Kevin Spacey to help drive the jokes home. Even with the all-star supporting cast, it’s the chemistry between the leads (which you get a better taste of during the outtakes) that holds the film together. You don’t believe they could create a Shower Buddy. You don’t believe they could kidnap anyone. You don’t believe they can get out of half the situations they get themselves into. What is believable is they’re three friends who argue a lot, get on each other’s nerves, and are constantly giving each other crap. Chris Pine is a great addition to the sequel. Pine delivers a few laugh-out-loud moments as the straight man with his sarcastic reactions. Horrible Bosses 2 is surprisingly funny sequel that’s more Beverly Hills Cop 2 than Teen Wolf Too (sorry Bateman). The movie earns every inch of its R rating with some very crude jokes that will make you laugh or cringe. If moviegoers are up for something non traditional Thanksgiving weekend, this is a great choice. Posted in Reviews and tagged Beverly Hills Cop 2, Charlie Day, Chris Pine, comedy, Grade: B, Horrible Bosses 2, Jamie Foxx, Jason Sudeikis, Jennifer Aniston, Jonathan Banks, Kevin Spacey, Revenge of the Nerds II: Nerds in Paradise, Teen Wolf Too. Bookmark the permalink.